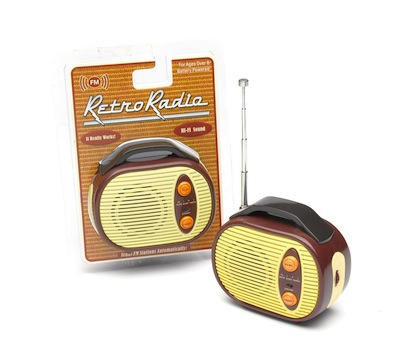 The Mini Retro Radio is a fabulous pocket radio which scans FM stations automatically. This battery powered funky retro style radio has easy to use controls, including an antenna, which you simply pull up for better reception. These Retro Radios come in an assortment of ridiculously cute styles and colour-ways; therefore it will depend on which way the airwaves are flowing as to which awesome Retro Radio you receive. But hey, each one has Scan and Reset buttons and Volume control, and allows you to listen to your favourite FM radio stations in good old fashioned style!You can pop one of these marvellous retro radios into your pocket and take it around with you, wherever you go. When you're stuck in traffic jams instead of draining your car battery you can listen to your favourite station on this cool retro style radio instead. It doesn't take up too much space on sideboards or shelves either, so you could always sneak it to work for some break time fun!